A simple, sensitive and rapid spectrophotometric method was developed and validated for the determination of two skeletal muscle relaxants namely, tizanidine hydrochloride (I) and orphenadrine citrate (II) in pharmaceutical formulations. The proposed method is based on the formation of a binary complex between the studied drugs and eosin Y in aqueous buffered medium (pH 3.5). Under the optimum conditions, the binary complex showed absorption maxima at 545 nm for tizanidine and 542 nm for orphenadrine. The calibration plots were rectilinear over concentration range of 0.5-8 μg/mL and 1-12 μg/mL with limits of detection of 0.1 μg/mL and 0.3 μg/mL for tizanidine and orphenadrine respectively. The different experimental parameters affecting the development and stability of the complex were studied and optimized. The method was successfully applied for determination of the studied drugs in their dosage forms; and to the content uniformity test of tizanidine in tablets. Tizanidine hydrochloride or 5-Chloro-N-(2-imidazolin-2-yl)-2,1,3-benzothiadiazol-4-ylamine hydrochloride(1-3), is a centrally acting skeletal muscle relaxant. It is an α2-adrenergic agonist that acts mainly at spinal and supraspinal levels to inhibit excitatory interneurones. It is used for the symptomatic relief of spasticity associated with multiple sclerosis or with spinal cord injury or disease. It is also used in the symptomatic treatment of painful muscle spasm associated with musculoskeletal conditions . The United States Pharmacopoeia (USP) recommends HPLC method for determination of tizanidine (I) in the raw material and tablets . Additionally, a number of methods like spectrophotometry [5–12], voltammetry [13–15], GC [16, 17], TLC [18–20] and HPLC [12, 18, 21–24], have been reported in the literature for the determination of tizanidine hydrochloride. Orphenadrine citrate (II) or N, N-dimethyl-2-[(2-methylphenyl) phenylmethoxy] ethanamine , is employed as skeletal muscle relaxant . The recommended method for determination of orphenadrine in USP  is HPLC while the British Pharmacopoeia (BP) recommends a potentiometric titration procedure for its assay of the raw material . Several methods for determination of Orphenadrine in pharmaceutical formulations have been described, via spectrophotometry [26–30], GC , capillary electrophoresis [32–35], TLC  and HPLC [37–39]. The formation of complexes between eosin Y as an ion pairing agent and many pharmaceutical compounds for their spectrophotometric or spectrofluorimetic analysis with or without metal ions has been frequently investigated [40–45]. The method suggested is devoted to study the formation of a binary complex between each of the studied drugs and eosin Y in an attempt to develop a simple, sensitive and accurate extraction- free spectrophotometric method for the determination of the studied drugs in their pharmaceutical preparations. A Shimadzu recording Spectrophotometer (UV-1601, P/N 206-67001) with 1-cm matched cells was used. All materials used were of Analytical Reagent grade, and doubly distilled water was used throughout the work. - Tizanidine hydrochloride and orphenadrine citrate were kindly provided by Sigma Pharmaceutical Company, Cairo, Egypt, they were used as received. - Eosin Y (Merck, Darmstadt, Germany), 4 × 10-3 M aqueous solution was prepared in distilled water. - Acetic acid and anhydrous sodium acetate (Merck, Darmstadt, Germany). - Acetate buffer, 0.4 M was prepared by mixing various volumes of 0.4 M acetic acid and 0.4 M sodium acetate solutions to obtain the required pH value. - Sirdalud® Tablets (labeled to contain 2 mg and 4 mg of tizanidine hydrochloride), Norflex® Tablets (labeled to contain 100 mg of orphenadrine citrate) and Norflex® ampoules (labeled to contain 30 mg of orphenadrine citrate/ml) were obtained from commercial sources in the local market. Stock solutions of 100.0 μg/mL for (I) or (II) drugs were prepared by dissolving 10.0 mg of either drug in 100 mL of distilled water. These solutions were stable for at least a week when kept in the refrigerator and protected from light. More dilute solutions were obtained by appropriate dilution. Transfer accurately measured aliquots of the stock solution in the concentration range shown in table 1 into a series of 10 mL volumetric flasks and diluted to about 7 mL with distilled water. 1 mL for (I) and 0.7 mL for (II) of 4 × 10-3 M of eosin Y solution was added to each flask, and the solutions were mixed well before the addition of 2 mL of 0.4 M acetate buffer (pH 3.5). the solution completed with distilled water to the mark. The absorbance was measured at 545 or 542 nm for (I) or (II) respectively against an appropriate reagent blank prepared simultaneously. To get the standard calibration graphs, the values of the absorbance were plotted against the final concentration in μg/mL, alternatively the regression equations were derived. %Error = % RSD/√n; Sa, standard deviation of the intercept; and ε, molar absorptivity. An accurately weighed quantity of the mixed contents of 10 pulverized tablets equivalent to 10.0 mg of either drug were transferred into 100 mL volumetric flasks, and completed to the mark with distilled water. The contents of the flask were sonicated for 15 min and filtered, and the above procedure was followed, the nominal contents were calculated either from the previously plotted calibration graphs or using the corresponding regression equations. An accurately measured volume of the mixed contents of 10 ampoules equivalent to 10.0 mg of orphenadrine citrate were transferred into 100 mL volumetric flask, and diluted to 100 mL with distilled water. The above procedure was followed; the nominal contents were calculated adopting the standard addition method. The stoichiometry of the reaction between the studied drugs and eosin Y was determined by continuous variation method (Job's method) , using equimolar solutions (1.5 × 10-3 M) for (I) and (1 × 10-3 M) for (II) of the drug and the reagent. Eosin Y was chosen as an ion-pairing agent with the aim of obtaining stable and water soluble ion pairs whose absorbance would be measured accurately. The described method has the advantage of being simple, fast, accurate, and precise for determining tizanidine and orphenadrine in their pharmaceutical formulations without interference from common excipients. Moreover, it is less time-consuming and does not require various elaborate treatment or tedious extraction procedures. These, in addition to the satisfactory sensitivity and simplicity make the method suitable for routine analysis in quality control laboratories. The proposed method is based on binary complex formation between the studied drugs and eosin Y. These complexes were probably formed via electrostatic interaction between the most basic center in the drug molecule (amino group) and the carboxylate anion of the dye. 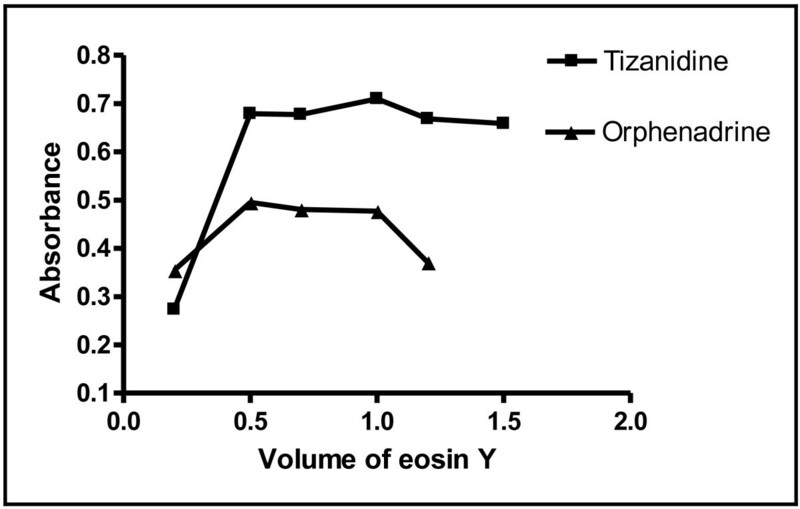 This primarily occurs in an acidic solution, increasing the electron delocalization of eosin and producing a bathochromic shift of the dye about 30 nm (Figure 1), Applying Job's method (Figure 2), it was found that, the reaction proceeds in the ratio of 1:2 of drug to eosin for tizanidine as it has two basic centers and while 1:1 for orphenadrine as it has one basic center of drug to eosin Y, the proposed mechanism of the reaction pathway is shown in Figure 3. Absorption spectra. (A) Blank eosin Y (4 × 10-3 M) in water (_ _ _). 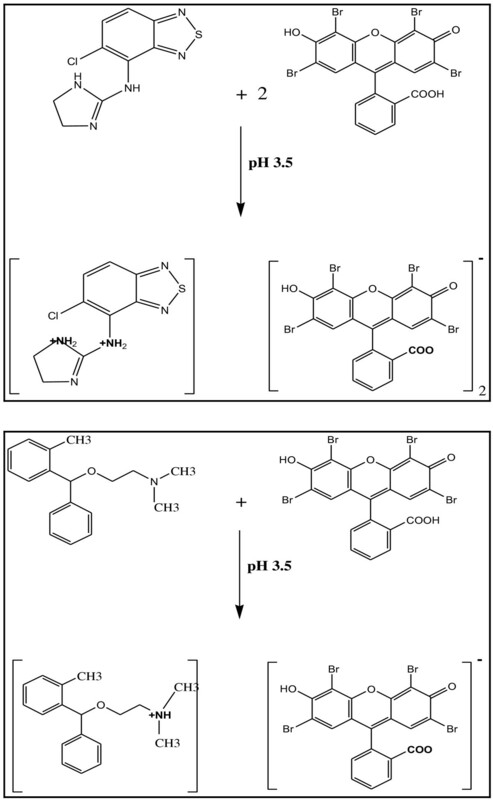 (B) Eosin Y binary complex with tizanidine hydrochloride (5 μg/mL) in water at pH 3.5 (--). (C) Eosin Y binary complex with orphenadrine citrate (5 μg/mL) in water at pH 3.5 (......). Continuous variation plots for the ion association complexes. (A) Tizanidine hydrochloride (1.5 × 10-3 M) with eosin Y (1.5 × 10-3 M). (B) Orphenadrine citrate (1 × 10-3 M) with eosin Y (1 × 10-3 M). Proposed mechanisms for the reaction between tizanidine and orphenadrine with eosin Y. (A) Proposed mechanism for the reaction between tizanidine and eosin Y. (B) Proposed mechanism for the reaction between orphenadrine and eosin Y. 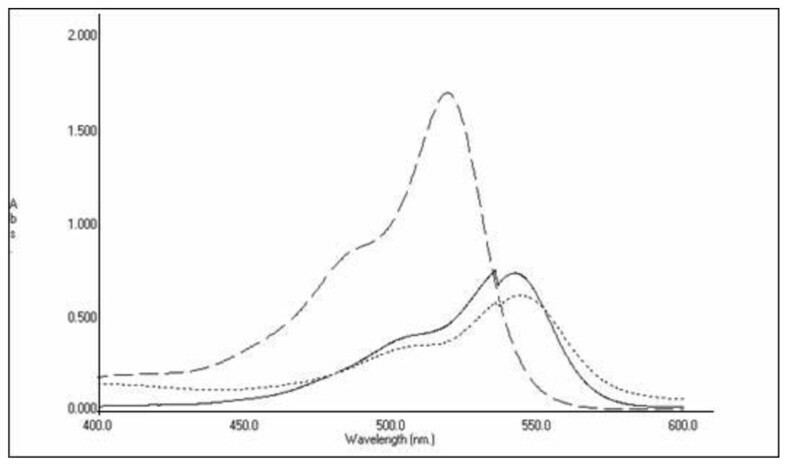 Due to the slight solubility of complexes formed with eosin Y in aqueous acidic solutions, it was difficult for the produced color to be accurately and precisely measured. Therefore, several trials for solving this problem were conducted, Via extraction with organic solvent  or addition of nonionic surfactant such as methyl cellulose to solubilize and stabilize the formed complex were attempted [40, 41]. Methyl cellulose and tween 80 were attempted to prevent complex precipitation, however the reproducibility was adversely affected; therefore, the method described by El-Brashy et al  was adopted. This method is based on keeping the sample concentration at maximum dilution before adding the dye solution at neutral solution, and mixing well before the addition of the acidic buffer. Applying this procedure, the complex stability was greatly increased, and prevention of precipitate formation with maximum precision was achieved. The order of addition of the reagent and buffer was essential for good precision. The proposed method has been successfully applied for determination of tizanidine and orphenadrine in their tablets and ampoules while the ampoules required application of standard addition method as it contains sodium hydroxide which causes significant decrease in the absorbance value , Application of standard addition method succeed to remove the interference of additives in the ampoules. Factors affecting the complex formation and stability were carefully studied and optimized. The influence of pH on the absorbance value of the binary complexes was studied over the pH range 2.6-4.5, Adjustment to pH 5 give negative absorbance values. The optimum absorbance values were obtained at pH 3.5 for both drugs as shown in Figure 4. Two milliliters of 0.4 M acetate buffer were sufficient to bring the optimum pH value. For the highest color intensity and maximum precision, the buffer solution should be added after mixing the drug-dye solution at neutral pH. Effect of pH of 0.4 M acetate buffer on the absorbance of the reaction product of tizanidine or orphenadrine with eosin Y (4 × 10 -3 M). The optimum reagent concentration was determined by adding various volumes of 4 × 10-3 M eosin Y solution. 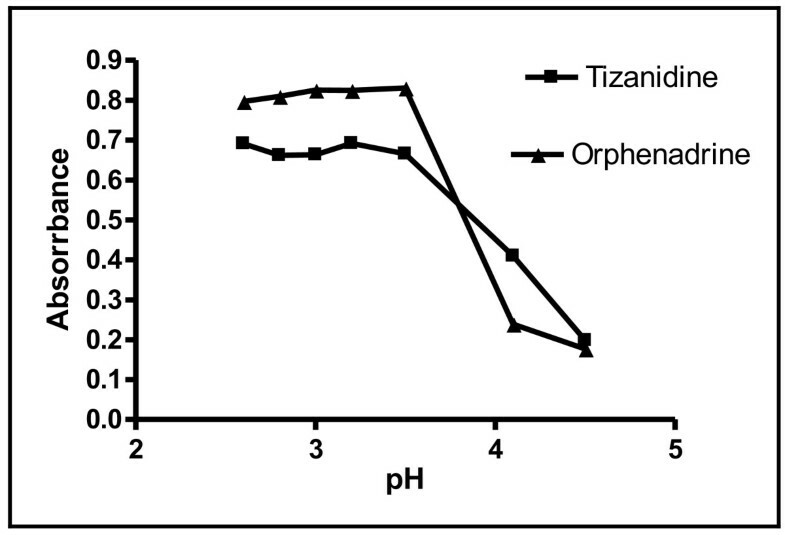 It was found that 1 mL and 0.7 mL of the reagent solution for tizanidine and orphenadrine respectively give the highest absorbance values as shown in Figure 5. Effect of volume of eosin Yon the absorbance of the reaction product of tizanidine or orphenadrine with eosin Y (4 × 10 -3 M). The intensity of the final color was maximum at room temperature for both drugs; increasing temperature resulted in formation of a precipitate which may be due to coagulation of the formed complex. The formation of the complex was instantaneous and the development of the color was complete within few seconds. The high values of the formation constants Kf = 2.69 × 1011 for tizanidine while for orphenadrine Kf = 4.77 × 104reveals high stability of the formed complex, the negative value of ΔG = -6.52 × 104 and -2.67 × 104 (KJ/mole) for tizanidine and orphenadrine respectively, points to the spontaneous nature of the reaction . The intensity of the final color was stable for 48 hours with no precipitation of the complex. Where (A) is the absorbance, (C) is the concentration in μg/ml and (r) is the correlation coefficient. Statistical analysis of the data gave small values of the standard deviations of the residuals (Sy/x), the standard deviation of the intercept (Sa), the standard deviation of the slope (Sb), and the percentage of relative error (% Er) as shown in table 1.
slope of the calibration curve. To prove the accuracy of the proposed method, the results of the assay of the studied drugs in pharmaceutical preparations were compared with the reference methods , the statistical analysis  of the results using student's t-test and variance ratio F-test showed no significant differences between them regarding accuracy and precision, tables 2 and 3. Application of proposed method to the determination of the studied drugs in their dosage forms. *Note. Each result is the average of three separate assays. Accuracy and precision data for the studied drugs using the proposed method. X ¯ = The mean recovery; SD Standard deviation of results. Intraday and interday precisions were assessed using three concentrations and three replicates of each concentration, the relative standard deviations were found to be very small indicating reasonable repeatability of the proposed method as shown in table 3. The robustness of the procedure adopted in the proposed method is demonstrated by the constancy of the absorption intensity with minor changes in the experimental parameters such as the change of the pH of acetate buffer 3.5 ± 0.2 for both drugs and volume of eosin 0.7 ± 0.2 and 1 ± 0.5 for orphenadrine and tizanidine respectively. These minor changes that may take place during the experimental operation did not affect the absorption intensity indicating the excellent robustness of the proposed method. The specificity of the method was investigated by observing any interference encountered from the common excipients of the pharmaceutical formulations. It was found that these compounds did not interfere with the results of the proposed method as shown in table 2. The proposed method was successfully applied to the assay of tizanidine and orphenadrine in their dosage forms as shown in table 2. The average percent recoveries of different concentrations were based on the average of three replicate determinations. The results obtained were in good agreement with those obtained by the reference methods . Due to the high sensitivity of the proposed method for the determination of tizanidine the content uniformity test was applied. The steps of the test were adopted according to the USP  procedures. The acceptance value (AV) was calculated and it was found to be smaller than the maximum allowed acceptance value. The results demonstrated excellent drug uniformity as shown in table 4. Results of content uniformity testing of Sirdalud® tablets using the proposed method. A Simple, sensitive, fast, accurate and precise spectophotometric method was developed for the determination of tizanidine and orphenadrine in their pharmaceutical formulations with limit of quantification of 0.26 μg/mL for tizanidine and 0.95 μg/mL for orphenadrine. Eosin Y was chosen as an ion- pairing agent with the aim of obtaining stable and water soluble ion pairs whose absorbance would be measured accurately. The advantage of the method being less time consuming and do not require various elaborate treatments and tedious extraction procedures, In addition to the satisfactory sensitivity and reproducibility as well as the convenience and simplicity. MIW designed the proposed method and analyzed the data statistically. FFB proposed, planned and supervised the whole work. MIE coordinated the study and modified the text. SAE carried out the experimental work. All authors read and approved the final manuscript.